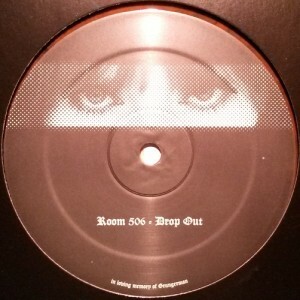 All of a sudden, Room 506 is inaugurated with a landmark release, giving us a new definition of industrial sound rites. Orange marbled vinyl* that has been selling out quickly, will be a dominant release at the year’s end and strong contender in the race for the very best of 2015. Steely kicks and synthetic convulsions of the A-side’s “Drop Out” go overdrive for a metal techno feel, but the real catharsis begins with suggestive female recitals, which are gradually sinking into the mess of vocal effects. On the flip, twelve minutes of “Red Embers” are made of extremely contagious matter, when the bass motors ahead with flamenco strings and a classical piano passage at the end. Above all that, an esoteric-sounding lady** examines blood-coloured sky and sun, turning to scholars for advice about the meaning of things. Real dark trance, you know from whom. ** Expert advice from Frozen Reeds helped to identify the origin of the vocal sample: It’s Nico from “Sagen die Gelehrten”.